Retro vibe merchants Electro-Harmonix enter the mic arena with a suitably retro model. The EH-R1 is a good mic to have in your arsenal if you're recording guitar bands. Yes, it's basic and there are better mics available, but it's a great piece of kit for the price. Affordable. Works well in a studio environment. Good for high frequncy instruments. Low sensitivity. Low frequency proximity. Lacks response of modern condensers. Electro-Harmonix are a company with a pretty colourful history. From insolvencies in the 80s to the purchase of Russian vacuum tube factory Sovtek, most people have heard of them because of their amazing guitar pedals. But now they've entering the microphone market with this retro ribbon mic. It's very much a back-to-basics approach here. In the early days of recording and broadcasting, the ribbon mic was the only real high-fidelity option. The most fragile of mic designs, its suspended filament design is surprisingly uncoloured but it comes with a couple of downsides: namely the traditional figure-of-eight pickup pattern and low output levels. However, aside from the shared fundamental design, ribbon mics can differ considerably, both in sound and scale. The EH-R1, although reasonably chunky, is not as large as the big AEAs, and resembles in shape and scale the later RCA 77 design seen on the Letterman show. As you'll see, the jet black finish imparts quite a sombre look, but at around half a kilo the EH-R1 doesn't feel too heavy. 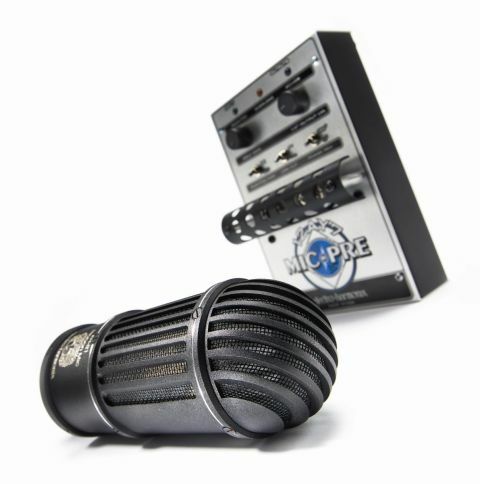 The mic comes packaged in a genuinely well-crafted wooden box, complete with painted EH logo. The accompanying literature is a little scant, but all mics are serial number stamped with their own frequency response chart. With its low sensitivity (1.6mV/ Pa) you'll want to keep this mic close to a decent pre-amp, but because it's a ribbon, also away from wind and plosives. Essentially, it's happy in a predictable studio environment. Its figure-of-eight pattern should also be taken into account. A quick look at the frequency plot indicates that it picks up equally from its back and front sides, but also that it has excellent rejection at 90 degrees. In a very dead room this may not be too significant, but if you´re recording in a more lively space you´ll certainly notice the ambience picked up from the back. As far as uses are concerned, ribbon mics tend to lend themselves well to certain instruments, and the EH-R1's frequency plot shows it´s no exception. It indicates a frequency peak at around 5kHz and then a tail off, and a general boost from 500Hz down with a peak at 150Hz. This makes it great for the spoken word and lower register singing. But that smooth tail-off in the higher frequencies also makes it great for electric guitar. In fact, any instrument that has complex high frequency content may benefit from the EH-R1 (I´m thinking saxophone, trumpet, trombone and metal percussion). Just make sure you keep a pop-shield handy. But if you're looking for the hyped response you get with modern condensers, the EH-R1 isn´t the ticket. It lacks the sparkle needed for modern female vocals and struggles when you need a really sensitive mic (picked acoustic and classical guitar). That´s not to say it can´t be used for those applications, especially if you're open to creating a new sound. Rock acoustic works quite well with the EH-R1 and it really captures the transients - but on balance there are better tools for the job. As with any figure-of-eight mic, you really have to keep a careful eye on your ambiences. If you're used to cardioid mics, it's very easy to get blasé about picking up the room sound. Also, that low frequency proximity that makes the EH-R1 good for the spoken word can become overbearing in other situations as well. The EH-R1 definitely isn't a one-stop solution, but it's the kind of mic you're going to buy when you already own a few other basics. There are other more refined ribbon designs out there, especially from the likes of Royer and AEA, but you'll have to pay considerable money for those.